Evidence is mounting that the Islamic State in Iraq and Syria (ISIS) is systematically committing atrocities in eastern and northern Syria, its areas of control. While individual incidents of brutality have been well-documented, the near-impossibility of on-the-spot reporting in the area controlled by the organization has made it difficult to build a general description of the situation there. However, as more and more witnesses come forward, the picture is gradually becoming clearer. ISIS invoked Qur'an 5:33 in a case of two people being crucified in Raqqa for supposedly carrying out an IED attack against ISIS. The Quran passage stipulates that, among a number of punishments, those who "wage war on God and His Messenger" may be crucified. An earlier case in Raqqa in late March was also justified as the appropriate penalty for alleged stealing and murder, though it was not officially advertised by ISIS. The case seems to fall under the same framework of Quran 5:33, which also mentions "striving to cause corruption on Earth" as an offense that can warrant crucifixion. Crucifixions are by no means the exclusive realm of ISIS: they can also be carried out in Saudi Arabia for crimes such as terrorism and highway robbery. The issue is that ISIS is defining itself as the one and only true Islamic state; in their view, waging war on ISIS thus constitutes waging war on "God and His Messenger." For ISIS, Raqqa — often described in ISIS circles as the "capital" of ISIS — is very much the prototype model Islamic city, where aspects of Islamic law are first introduced and are then spread to other areas of ISIS-held territory. (Their territory currently encompasses all major urban areas in Raqqa province, eastern Aleppo province, and most of southern and central Hasakah province). The crucifixions are a case-in-point: once implemented officially in Raqqa, the practice then spread to other ISIS strongholds, most notably the Aleppo provincial towns of Maskanah and Manbij. As in Raqqa, those subjected to crucifixion are suspected of having had ties to rival underground rebel groups trying to undermine ISIS with clandestine attacks. 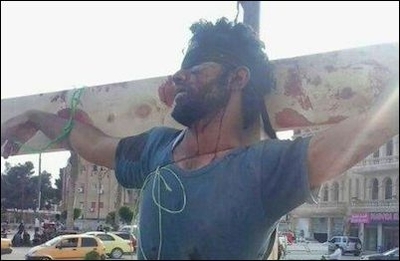 In Maskanah, the crucifixion was presented as the "punishment for apostasy" for one of three alleged "shabiha" members. By invoking apostasy, ISIS likely is referencing this hadith, where it is stipulated that one of the cases in which a Muslim's blood may be lawfully shed is for fighting against God and His Messenger (similar to Qur'an 5:33). In this case, the punishment is crucifixion or exile. The crime in question has been interpreted to be apostasy. Also in Raqqa, Christians have had the first dhimmi pact from ISIS imposed upon them. Christians there are required to pay a special tax (jizya) to the ISIS authorities. Christians may not publicly wear crosses, pray in the presence of Muslims, or repair or renovate places of worship. As with the crucifixions, ISIS invoked Qur'anic justification for imposing the dhimmi pact: Qur'an 9:29. (This invocation was largely overlooked in prior media coverage of this development.) ISIS later announced that arrangements were underway for the imposition of the dhimmi pact on Christians in Hasakah province living under ISIS dominion. Last month, a group of activists in Raqqa city formed a group called "Raqqa Is Being Slaughtered Silently" with hopes of spreading information about the city's current condition. The 20 members of the group were then sentenced to death by ISIS for "non-belief in Islam." A large cash prize has been offered by ISIS for information leading to their capture. The horror gets worse: the most shocking evidence of brutality comes from witnesses to the jails maintained by ISIS. Perwer Janfrosh, a 25-year-old Syrian Kurd from the city of Kobani, was arrested by ISIS while attempting to cross the Syrian-Turkish border. He was held for five days in an ISIS jail in the town of Jarabulus in northern Syria. Janfrosh claims to have witnessed the torture and killing of a Kurdish man for the "crime" of raising the flag of the Kurdish YPG militia in the town, and also the torture of Arab residents of the town who had been arrested for drinking alcohol. Said al-Adlubi, a Syrian Arab refugee and former fighter with the Free Syrian Army, told the "Rescue Christians" organization that he witnessed the slaughter of kidnapped Christians in ISIS captivity who were killed because ransom had not been paid. Adlubi also said he had seen a gruesome mortuary maintained by ISIS, where the corpses of slaughtered prisoners were hung on hooks. Rescue Christians spoke with a second witness — Kamil Toume, a Syrian Christian and former prisoner of ISIS — who confirmed Adlubi's account of the "slaughterhouses." Janfrosh and Adlubi both spoke of being described as "apostates" by their ISIS captors. Apostasy is a crime punishable by death according to Sharia law. The brutality of ISIS ultimately is no surprise: the group already considers itself a state (dawla), not a mere group or organization (jamaat, or tanzim). Those descriptors are considered insulting by ISIS. ISIS intends to establish itself for the long-run, and is not open to power-sharing, compromise, or accountability at the hands of arbitration by a third-party. Totalitarianism is thus the natural consequence, as is the wider infighting between ISIS and other rebel groups across many parts of Syria. Most notably, intense fighting has occurred with Syria's official al-Qaeda affiliate, Jabhat al-Nusra, as ISIS seeks to connect Anbar province in western Iraq with its territorial holdings in Syria. Jonathan Spyer is a senior research fellow at the Global Research in International Affairs (GLORIA) Center and a fellow at the Middle East Forum. Aymenn Jawad Al-Tamimi is a student at Brasenose College, Oxford University, and a Shillman-Ginsburg Fellow at the Middle East Forum.